Tacky season’s Greetings to All! This holiday season, as you drive around town experiencing the magnificent light displays throughout our fair city, you may take a moment to wonder: Why do people devote countless hours and a good chunk of change to participate in a trend now lovingly known as a tacky light tour? How did tacky lights even become a thing? The history of using lights to celebrate Christmas goes all the way back to Thomas Edison and the history of electricity. Although Edison did not invent the light bulb, he did create the first commercially viable incandescent bulb. Edison was not just a successful inventor, though; he was also an accomplished businessman and marketer. The first year the Mustian family lived on Christmas Court, they made a rookie mistake and traveled for Thanksgiving week. “When we got home, the entire street was lit up except for us,” Mustian remembers. One of his notable marketing successes happened during the 1880 Christmas season. To win a contract to power the borough of Manhattan, Edison created an impressive light display on the grounds of his factory, which happened to be alongside the railroad from New York to Philadelphia. His remarkable display earned him the nickname Enchanter. Over the next forty years or so, Christmas trees with electric lights could be found on displays in public, such as at the White House, but they were far too expensive for most people to use at home. A single strand cost roughly $300 in today’s money. Eventually, however, outdoor lights became commercially available, and companies like Edison Electric sponsored competitions for outdoor decorating. Holiday lighting, however, became less prevalent during World War II because of shortages. In GE ads from 1945, consumers were notified that Christmas lights would be produced again for the “Victory Christmas,” albeit in limited quantities. 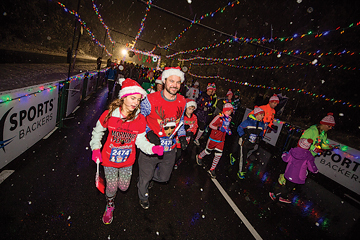 The sixth annual CarMax Tacky Light Run winds its way through Walton Park, where almost all the houses are decorated. The 1950s brought increased prosperity and a renewed interest in creating outdoor light exhibits. Public displays grew more creative. On one coast, tourists could see the extravagantly lit tree at Rockefeller Center, while on the other, car passengers took in the giant illuminated snowman along the Miracle Mile in Los Angeles. Cities hosted decoration competitions to bring together communities and evoke the magic of small-town living. Since then, holiday light displays have continued to grow, providing opportunities for neighbors to become friends and for families to enjoy special time together. During his tenure from 2009 to 2016, Mayor Dwight C. Jones christened Richmond the “Tacky Lights Capital of the World.” But Richmond’s involvement with the tacky light craze goes even further back. It began in the mid-1980s when WVGO DJ Mad Dog – formally Barry Gottlieb – started the first tacky light tour on a Winn Transportation bus. At the time, the Tacky Xmas Decoration Contest and Grand Highly Illuminated House Tour featured ten to twelve houses on its route. Back then, there were houses with a lot of lights in the area, but they weren’t well known. “A couple of friends and I would go check out some houses we knew or found out about that had lots of lights, and we loved it,” Gottlieb says. 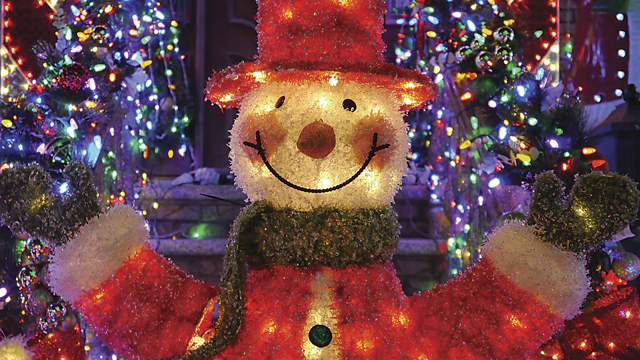 He was determined to find more decorated houses – and the official light tour was born. Gottlieb recalls how quickly things developed. “I was going to rent one of the then newly motorized trolleys, but decided it might be too small, so I rented a bus from Winn Transportation. I sent more press releases out about tickets being sold for the bus. The bus sold out within an hour,” says Gottlieb. After he added another bus to the tour, that one sold out in a couple of hours. “I thought about adding more, but got nervous about handling the whole thing.” Gottlieb says he told people to meet the buses and follow them. More than one hundred cars ended up trailing the buses that year. As they toured the houses, they awarded homemade – and very tacky, Gottlieb says – trophies to the top three houses along the route. After a couple of years, private transportation companies took over the tour, while Gottlieb continued to host the contest. About twenty years ago, Mad Dog (Gottlieb) was quoted in an article by Bill McKelway in the Richmond Times-Dispatch predicting that someday, someone would try to figure out how the tacky light tradition started in Richmond: “I have this image of twenty years from now, Richmond being the biggest place in the world for Christmas lights and people will all be asking, ‘How did this thing ever get started?’ It’s like I’ve seen the ghost of Christmas future. But I’m not going to be anywhere around. When they come looking for me, I’ll be in Bangkok or Havana sitting at a bar sipping some Jose Cuervo.” I managed to track Gottlieb down, and although he has traveled to both Bangkok and Havana, he currently resides in Oakland, California. 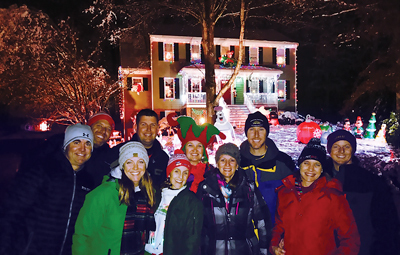 Despite – or perhaps because of – its break from traditional Christmas décor and lighting in the area, the Tacky Lights Tour became a huge hit. In 1989, the Richmond Times-Dispatch took advantage of momentum and began compiling lists of houses. People had to submit their houses to the newspaper for consideration, and there were two conditions: Houses needed to have at least 10,000 lights, and they needed to be located in Richmond, Chesterfield, Hanover, or Henrico. Over the past nearly twenty years, the number of lights required for official inclusion on the tour has increased to 40,000, and many more houses have been added to the list. 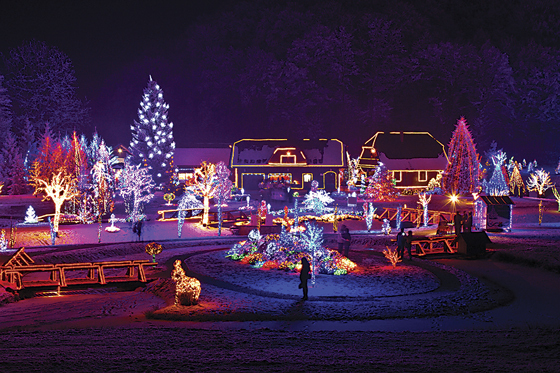 Several individual tacky light engineers from Richmond have won national prizes for their amazing displays. Hunter Bottoms’ house in Brandermill, for instance, won the USA Today contest for Best Holiday Lights in 2014. While the win was exciting, he ended up having to shut down his display for a while because the traffic from visitors became too disruptive. Two years in a row, Henrico homeowners have won $50,000 on the ABC reality show, The Great Christmas Light Fight. Al and Esther Thompson of Wendhurst Drive in Glen Allen won in 2016. In addition to winning, they have garnered national attention, appearing on shows like NBC Nightly News and CBS Sunday Morning. Last year, their display included more than 170,000 lights, and they have over a thousand handmade decorations. In 2017, the Phifer family from Asbury Court in the West End claimed top honors in The Great Christmas Light Fight. Bobby Phifer has always decorated his own house as well as his parents’ house next door. His mother passed away last spring, but Phifer had promised to continue decorating it in her memory. The Phifers have nearly 1.5 million lights between the two houses. Another well-known, longtime figure in the tacky lights world is Frank “Mr. Christmas” Hudak, so named because he wears a Santa suit decorated with LED lights. 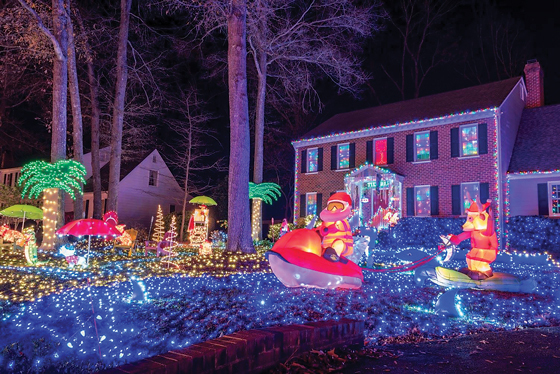 Hudak has been lighting up his house on Wistar Court for more than forty years and has raised over $100,000 for the Virginia Home for Boys and Girls. He has also been featured in New York Times Magazine and on NPR. Over the years, the cast list of light lovers has grown as more homes have entered the official tour, and still more decorate unofficially. Many families choose not to participate in the tour, either because they don’t want to count the number of lights to verify eligibility or they don’t want to disrupt the neighborhood. Whether or not they are official, these brilliantly illuminated and decorated homes offer endless entertainment for holiday revelers who want to get into the spirit of the season. In the early years of the Tacky Lights Tour, there were only two houses included from Chesterfield County. Last year, there were twenty. Chesterfield has stepped up its game, and possibly the best place to see the tacky lights is in Walton Park, a neighborhood that is home to Christmas Court and, notably, hosts the CarMax Tacky Light Run every year. The race has helped motivate reluctant decorators in the area. Kate Ray started lighting up her house when she moved in five years ago on Hollypark Drive. That first year, she was the only one on her street to decorate outside. “Then they ended up routing the race through our street,” Ray says, “so I took that as an opportunity to go full blown.” Ray set up a 30-foot PVC ladder with a hand-painted cutout of Elsa from Frozen on top. “There was Elsa on top of a lit-up, white staircase with lights shooting out from her hands like she was lighting up my yard.” Over time, her neighbors have gotten more interested and have started to put up lights also. Ray even paints wooden cut-outs to help neighbors decorate more efficiently. One section of Walton Park did not have to wait for the Tacky Light Run to come through their street to go all out with their elaborate Christmas lights: Dawnridge Court (now known as Christmas Court). When Katy Mustian first spotted her house six years ago, she started asking people about the neighborhood. The first response was, “You know that’s Christmas Court, right?” She and her family hadn’t, but they decided to buy the house anyway. The first year, they made a rookie mistake and traveled for Thanksgiving week. “When we got home, the entire street was lit up except for us,” Mustian bemoans. They quickly got to work creating a beach-themed display, and each year they have added to it. After the first year, they caught up with the rest of Christmas Court and have since won awards for best theme and overall tackiest house. Now the Mustians no longer travel on Thanksgiving; instead they spend every weekend in November working on their display. “While we’re out there putting up lights, we chitchat with our neighbors; there is a camaraderie as well as friendly competition,” Mustian says. Virginia Goin, president of the Walton Park Association, says that when one family moved into a house on Dawnridge last summer, they received all the home’s Christmas lights and detailed installation instructions. “The former owners basically said, ‘We’re sorry you moved to Christmas Court. We hope you love it. You don’t have to buy a thing.’” That gift of paying it forward exemplifies the community spirit of the neighborhood, Goin says. Despite the traffic challenges, the families also really enjoy having visitors drive up and down their streets. “We go out and talk to people in their cars,” Mustian says. “We love being a part of it.” The families also enjoy the sense of accomplishment that comes from having people tell them how much they love seeing the decorations. “It’s a privilege to be part of this big thing that’s so well known throughout the area,” says Ray. Many of the tacky-light families in Walton Park and elsewhere have worked hard to create the right setup to display so many lights. The Mustians, for instance, use all LED lights. Those lights can be more expensive to purchase, but both the Mustians and the Rays have tried to buy them during after-holiday sales to save money. That makes good sense, according to Leroy Atkins, who educates the community for Dominion Energy. He strongly recommends that people replace all lights with LED lights to help conserve energy and save money. 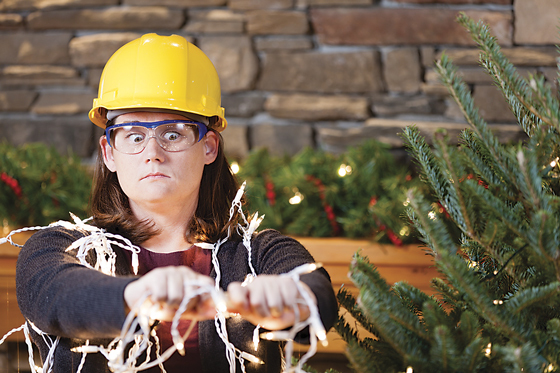 “LED bulbs uses 25 to 80 percent less energy,” explains Atkins, “and can last much longer.” LED light strings could still be in use forty holiday seasons from now. Atkins also recommends that families use a timer for their holiday displays to save energy. That works well for Kate Ray. “I have the lights on a timer from about five to ten at night and a lot of the lights twinkle, so I haven’t seen a big jump in my electrical bill,” she says. Another of Atkins’ recommendations to families? Stay keenly aware of fire hazards. “We do not recommend plugging an extension cord into another extension cord,” Atkins says. Participants also need to use cords that are designed specifically for outdoor use. The Mustians have solved many electrical challenges in part by having a detached garage on a separate electrical circuit. They have a special 12-plug outlet specifically installed just for the Christmas lights, so they don’t have to worry about overloading the circuit for their house. By taking the right precautions, homeowners can ensure that their displays are not only beautiful, but also safe and energy-efficient.